AMA Get Out & Ride! Whether you ride across the country, commute to work, support motorcycle charity rides or are a weekend warrior, the American Motorcyclist Association is where the motorcycling community comes together for you. We understand and share your passion for riding, and we work every day to make sure intrusive laws or unsafe fuels never get between you and your bike. Join the AMA now and help support the work we do. When you get out and ride, you can take comfort in knowing that the AMA supports you and your fellow riders. The AMA is your strongest advocate in Washington, D.C., in your state capital and at the local level. Our freedoms are threatened by fuel standards that create risk of engine damage and sound restrictions that unfairly target motorcyclists. Behind the scenes, the AMA is also an important resource for state motorcyclists’ rights organizations and works hand in hand with them and local groups to defend against unfair state and local laws, such as motorcycle-only checkpoints. Visit our AMA Action Center to see what’s happening in your state and around the country. Find local events and meet like-minded motorcyclists. For many, riding is all about having fun, and AMA-sanctioned rides, rallies, tours and programs are the best in America. Learn about the AMA Premier Touring Series and the AMA LongRider Program. Find events in your area! Click here to find an event. Click here to find clubs. Since the start, the AMA has promoted Gypsy Tours – one of the most authentically cool experiences on two wheels. These day-long or overnight meets include a ride from a designated starting point to a point of interest or to a destination such as a campground, national monument, motorcycle meet or cookout. Multiple events may be included in the Gypsy Tour sanction. Often, another sanctioned meet takes place at the Gypsy Tour destination, such as a field meet or an amateur or professional race. National Gypsy Tours are premier, national-level events selected by the AMA. AMA National Gypsy Tours bring like-minded riders together to enjoy the comraderie of motorcycling, often in a location of particular beauty, historic significance or importance to the sport. AMA National Gypsy Tours are open to all riders interested in fun, friendship and motorcycles. In addition, AMA member benefit partners provide AMA members dozens of money-saving discounts. These benefits can save you more than the cost of your annual membership dues! Check out AMA member benefits here. Through American Motorcyclist magazine, the AMA reports on government relations efforts, safety information, fun events for riders and exclusive money-saving member discounts. Choose between our street and off-road-and-competition versions based on your riding interests. Both editions are available online to AMA members here. Are you ready to stand with hundreds of thousands of riders who joined the AMA to protect their right to ride? Click here to join the AMA and help support the AZRATPack. 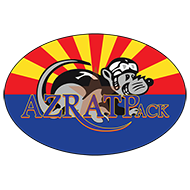 AZRATPack, Proudly powered by WordPress.